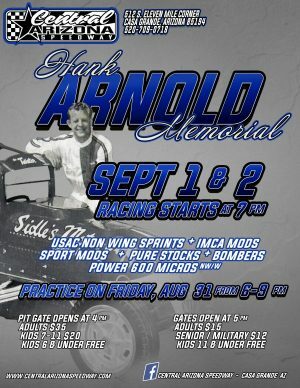 Central Arizona Speedway will return to action Labor Day weekend September 1st and September 2nd for the Hank Arnold Memorial. It will be a two day racing spectacular with the return of the ASCS Wingless Sprint Cars. The USAC Sprint Cars will be joined by the IMCA Mods, IMCA Sport Mods, Pure Stocks, Bombers and Power 600 Series Micros. Racing action begins at 7:00pm. Pits open at 4:00pm, Front Gates open at 5:00pm. Cost of admission is $15 for Adults, $12 for Seniors/Military and Kids 11 and under are free. Central Arizona Speedway is located at 512 S Eleven Mile Corner Road, Casa Grande, AZ 85194 behind the Pinal County Fairgrounds. Follow us at https://www.facebook.com/Central-Arizona-Speedway-Casa-Grande-AZ or log onto www.CentralArizonaSpeedway.com or call 520-709-0718 for more information.